Highlight your brand and differentiate your machine through a custom HMI overlay. 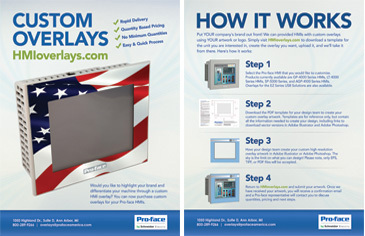 You can now purchase custom overlays for your Pro-face HMIs. Pro-face offers Rapid Delivery, and Quantity Based Pricing with No Minimum Quantities. No job is too big, and no job is too small! Simply download a template, create your artwork, upload it, and we’ll take it from there.